BWG840F is a low cost, open source, secure industrial IoT gateway bridging a WiFi router to Bluetooth, Thread , or Zigbee devices. Its low cost, long range (1800 meters at 125 Kbps), and CryptoCell 310 co-processor for security will enable mass deployment of IoT devices in industrial and agriculture applications. BWG840F is in market ready enclosure. Upon completion of firmware and app development, you can begin marketing products. Our host board and enclosure design is an example for minimizing Bluetooth range degradation. You can use our schematics if you are interested in developing your own products. As an experienced and efficient manufacturer of IoT PCBAs, our production cost is very competitive. Custom enclosure is available. A BlueNor BT840F Bluetooth 5, Thread, Zigbee module. An ESP32 WiFi module is used to establish and maintain internet connection through a WiFi router. Source codes for use with Mongoose OS are available for developing interface with cloud server. A Development Kit (DK) is required to load program into WiFi module. The USB cable assembly included in DK-BWG840F can be used to load program into WiFi module of production gateway BWG840F. 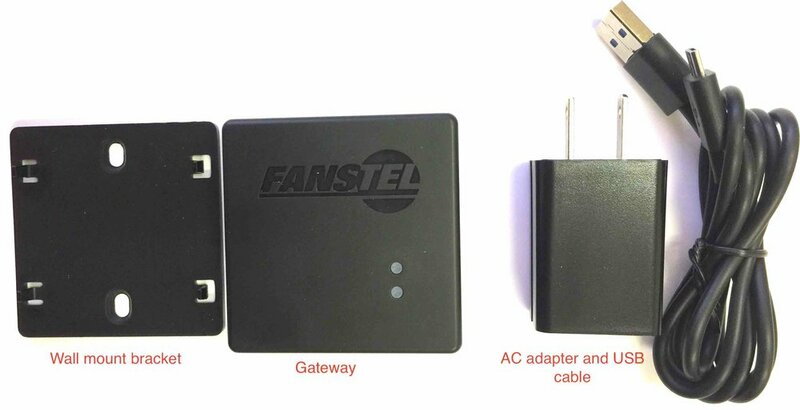 A set of demonstration codes for a BLE 5 sensor sending temperature and humidity data to a BWG840F connected to a Fanstel development server using MQTT protocols can be downloaded from Download OpenSource Document webpage. Hex and source codes for use with Mongoose OS to connect to Google IoT Core cloud server can be downloaded from Download Open Source Document webpage. External antenna included when required. CryptoCell 310 co-processor in BT840F module can offload decryption and authentication of messages, required in Bluetooth SIG mesh. Cortex M4F MCU can relay messages in a large mesh network efficiently. For industrial applications or larger mesh network, BWG840F is required to relay messages. Bluetooth range: 1800 meters at 125 Kbps with 60% Fresnel zone clearance. BWG840F and DK-BWG840F are available. Relays messages between cloud server and Bluetooth devices. USB cable assembly included in DK BWG840F only is required to program WIFi module. Development kit for BWG840F Bluetooth 5, Thread, Zigbee to WiFi Bridge. Includes an enhanced BWG840F gateway, USB cable assembly, and flat cable. DK BWG840G is required to load firmware into WIFi module. 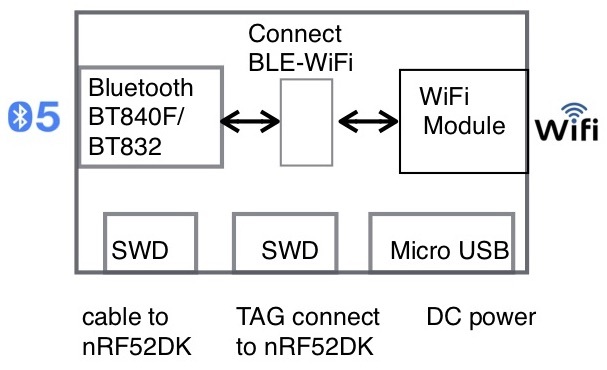 It is easier to load firmware into Bluetooth module by using a DK.